เกบาราเป็นบุคคลทางประวัติศาสตร์ที่ได้รับทั้งเสียงยกย่องและเสียงประณาม มุมมองต่าง ๆ เกี่ยวกับตัวเขาได้รับการรวบรวมไว้ในจินตนาการร่วมในรูปของสื่อจำนวนมาก ไม่ว่าจะเป็นหนังสือชีวประวัติ บันทึกความทรงจำ ความเรียง สารคดี เพลง หรือภาพยนตร์ เนื่องจากการยอมสละชีพเพื่อความเชื่อของเขา การปลุกเร้าด้วยบทกวีเพื่อให้เกิดการต่อสู้ระหว่างชนชั้น และความปรารถนาที่จะสร้างความสำนึกของการเป็น "คนใหม่" ซึ่งขับเคลื่อนด้วยจริยธรรมแทนที่จะเป็นสิ่งจูงใจทางวัตถุ เกบาราจึงกลายมาเป็นบุคคลสัญลักษณ์ที่สมบูรณ์แบบของขบวนการทางการเมืองต่าง ๆ ที่นิยมฝ่ายซ้าย เขาได้รับเลือกจากนิตยสารไทม์ให้เป็น 1 ใน 100 บุคคลผู้ทรงอิทธิพลที่สุดในคริสต์ศตวรรษที่ 20 ส่วนภาพถ่ายของเขาที่มีชื่อว่า นักรบกองโจรผู้เป็นวีรบุรุษ (Guerrillero Heroico) และถ่ายโดยอัลเบร์โต กอร์ดา ก็ได้รับการยกย่องจากสถาบันวิทยาลัยศิลปะแมริแลนด์ว่าเป็น "ภาพถ่ายที่มีชื่อเสียงที่สุดในโลก"
↑ 6.0 6.1 Unknown, Autor. "Guevara, Che". Encyclopædia Britannica Online. สืบค้นเมื่อ 30 September 2001. 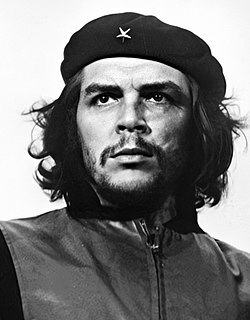 ↑ 8.0 8.1 On Revolutionary Medicine Speech by Che Guevara to the Cuban Militia on August 19, 1960. "Because of the circumstances in which I traveled, first as a student and later as a doctor, I came into close contact with poverty, hunger and disease; with the inability to treat a child because of lack of money; with the stupefaction provoked by the continual hunger and punishment, to the point that a father can accept the loss of a son as an unimportant accident, as occurs often in the downtrodden classes of our American homeland. And I began to realize at that time that there were things that were almost as important to me as becoming a famous or making a significant contribution to medical science: I wanted to help those people." ↑ Kellner 1989, pp. 69–70. ↑ Anderson 1997, pp. 526–530. ↑ "On Development" Speech delivered by Che Guevara at the plenary session of the United Nations Conference on Trade and Development in Geneva, Switzerland on March 25, 1964. "The inflow of capital from the developed countries is the prerequisite for the establishment of economic dependence. This inflow takes various forms: loans granted on onerous terms; investments that place a given country in the power of the investors; almost total technological subordination of the dependent country to the developed country; control of a country's foreign trade by the big international monopolies; and in extreme cases, the use of force as an economic weapon in support of the other forms of exploitation." ↑ At the Afro-Asian Conference in Algeria A speech by Che Guevara to the Second Economic Seminar of Afro-Asian Solidarity in Algiers, Algeria on February 24, 1965. "The struggle against imperialism, for liberation from colonial or neocolonial shackles, which is being carried out by means of political weapons, arms, or a combination of the two, is not separate from the struggle against backwardness and poverty. Both are stages on the same road leading toward the creation of a new society of justice and plenty." ... "Ever since monopoly capital took over the world, it has kept the greater part of humanity in poverty, dividing all the profits among the group of the most powerful countries. The standard of living in those countries is based on the extreme poverty of our countries. To raise the living standards of the underdeveloped nations, therefore, we must fight against imperialism." ... "The practice of proletarian internationalism is not only a duty for the peoples struggling for a better future, it is also an inescapable necessity." ↑ Ryan 1998, p. 4. หน้านี้แก้ไขล่าสุดเมื่อวันที่ 11 เมษายน 2562 เวลา 02:08 น.